Pixel Dan is back with a new review. This time he takes a look at the MOTU Classics Club Grayskull Ultimate Edition He-Man from Super7! 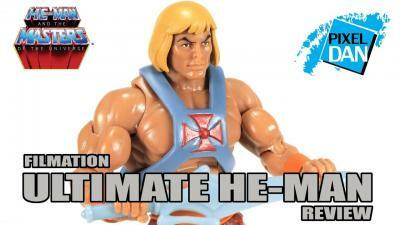 Check it out below and click here to join the discussion on the He-Man.Org forums! Here we go at last! The evil Skeletor's massive, and we mean MASSIVE, fortress is here! The Masters of the Universe Collector's Choice Snake Mountain Playset stands 36-inches high and opens to a staggering 48-inches wide, making it the most absurdly large Masters of the Universe playset ever made! The Masters of the Universe Collector's Choice Snake Mountain Playset will be available for pre-order from May 1st to 31st for $600 (plus shipping) and a 6-month payment plan will be available. Figures are not included.